Vintage Gas Stations Themes, Sports Themes, Vintage Americana Themes, Railroad Themes, And More!!! When cars became popular in America, many gas stations were full service facilities and often branded with one particular fuel company. A uniformed service attendant would come to your car, fill the tank, wash your windshield, and would often also check your oil and the air in your tires. Texaco used service attendants on their television show Texaco Star Theater, a variety show hosted by Milton Berle, from 1948 to 1953. The uniformed men sang the opening song touting the friendliness and knowledge of Texaco service attendants and then would act as 'guardian angels' through the rest of the show, doing good deeds. However, the most iconic use of the Texaco service attendants was with the 1960s Texaco jingle "You can trust your car to the man who wears the star", written by Roy Eaton at Benton & Bowles advertising firm. This advertising campaign made Advertising Age's Top 100 list for the 20th century's best advertising. This door takes that little piece of petroliana history and immortalizes that man who wears the star jogging over to the Texaco gas pump. 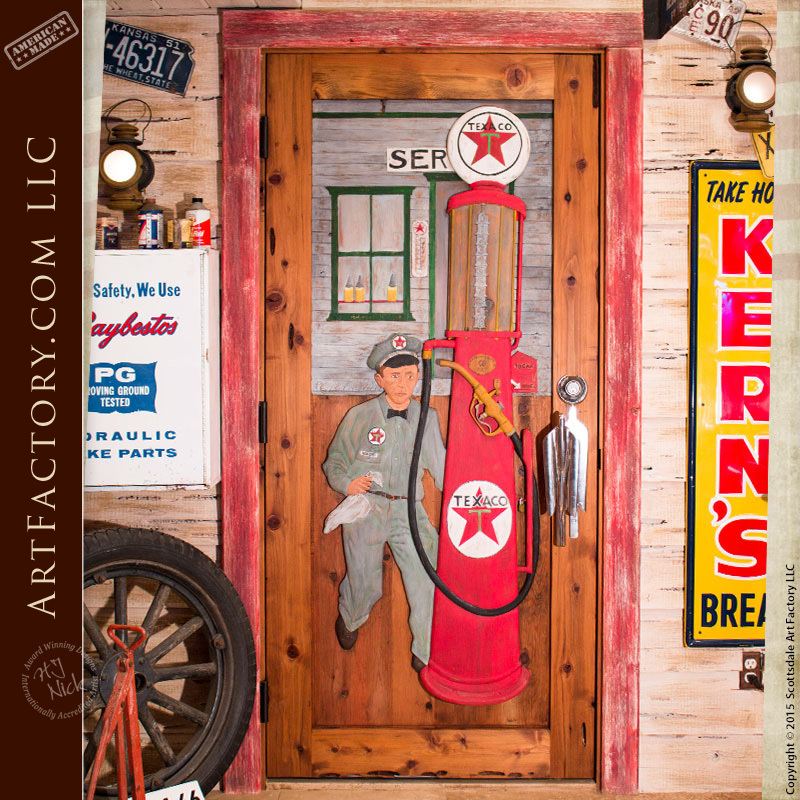 Our master craftsmen created an entire service station with a visible gas pump and used the Texaco star in all its bright colors to create the ideal door for the entrance to your garage or man cave. Choose your favorite piece of American history and call ArtFactory.com to have a custom entrance door created for you. Why settle for a plain door when you can order a custom, made to order, handcrafted door to hang as a functional work of art in its place? 1920's era Texaco Station with visible gas pump and station attendant. "You Can Trust Your Car To The Man Who Wears The Star"
See Our Wayne Model 628 Vintage Visible Gas Pump With Historically Correct 1920's era Texaco Signage And Original 1920's era milk glass gas globe. Very rare first ever electric model!